The FP7 Project ECONADAPT came to a close in September 2016 after three years of research on the economics of adaptation. The main impetus of the project was to support adaptation planning through building the knowledge base on the economics of adaptation to climate change and converting this into practical information for decision makers. As an output of the project, Ecologic Institute has led work in the development of the ECONADAPT Toolbox and the ECONADAPT Library, which will remain available to the public and interested stakeholders. Ecologic Institute lead the development of the toolbox including guidance documents and a cost and benefit data repository for economic assessment of adaptation targeted at economists and other end-users, in particular policy makers. 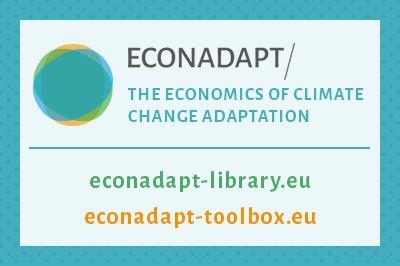 The ECONADAPT Toolbox provides easy access to information on economic assessment of adaptation activities. It is relevant for policy makers and economists looking to implement and adjust methods for their own assessments or simply gathering information on how to interpret results or methodological approaches. It provides in particular information on methodologies, data and evidence through case studies (Insights) for practitioners and economists. Furthermore, it can be of interest to a wider group of experts, stakeholders, and students carrying out case studies. The Toolbox can be operated along two axis with users choosing from five adaptation "challenges" (Project Appraisal, Policy Impact Assessment, Disaster Risk Management, Macro-economic Assessments and International Development) and several economic appraisal methods, their strengths and weaknesses, as well as their applicability and treatment of uncertainties. Additionally, each appraisal method and adaptation challenge is accompanied by practical examples. 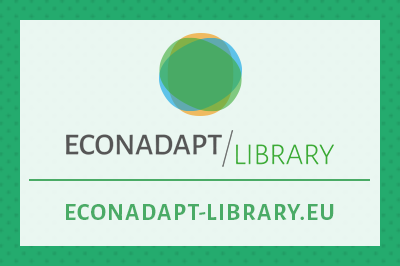 The ECONADAPT Library is a database that contains grey and academic literature on the economics of adaptation developed by the project partners. The Library is a living database that accepts submissions from external authors and in this way sets out to collect and make accessible a broad range of open-access literature and journal articles on the economics of adaptation. Users can use different search functions to narrow down literature with options to search via decision support tool, relevant sector, governmental scale or year of publication. The ECONADAPT project website is the main communication hub of the project. It presents the advanced knowledge and evidence base on the economics of adaptation, and the conversion of the findings into practical material to support decision making. 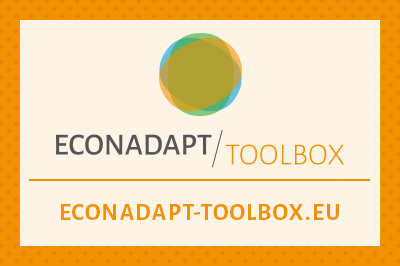 The project website is a central entry point for the two prepared tools: the ECONADAPT Toolbox and the ECONADAPT Library.